The goal of the Dashboard is to provide a place where you can instantly get a pulse on the current financial health of your business. The Dashboard should be a stress reliever when your business is doing well, and a source of motivation and urgency if you’re falling behind. There are over a dozen metrics widgets on the Dashboard. Each widget has been designed to communicate its unique data in the easiest and quickest way possible. Let’s walk through each of these widgets and explain what they communicate. This widget displays the total revenue (invoice payments) you’ve received for the selected year, and compares it to your Yearly Revenue Goal. 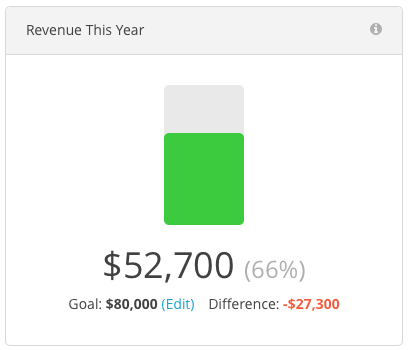 Your Yearly Revenue Goal is displayed at the bottom of the widget and labeled “Goal.” The difference between your total revenue and your yearly revenue goal is also displayed at the bottom of the widget and labeled “Difference.” If your difference is a positive number that means you’ve already met or exceeded your yearly revenue goal. If it’s a negative number it means you’re still working towards your yearly revenue goal. 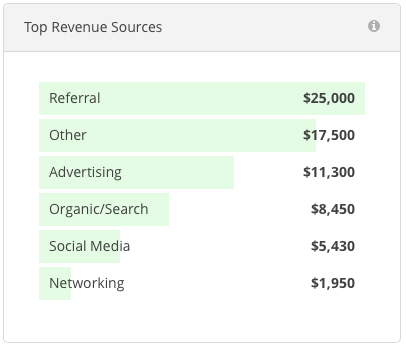 You’ll also see a percentage value in light gray next to your total revenue. This percentage tells you how close you are to meeting your yearly revenue goal. For example, if the percentage value is 60%, that means the total revenue you’ve received is 60% of your yearly revenue goal. You still have 40% more to go before your goal is met. This widget displays the total revenue (invoice payments) you’ve received for the current month, and compares it to your monthly revenue goal. Your monthly revenue goal is the average amount of revenue your business should be making each month in order to stay on track to meeting your Yearly Revenue Goal. Your monthly revenue goal is displayed at the bottom of the widget and labeled “Goal.” The difference between your total revenue this month and your monthly revenue goal is also displayed at the bottom of the widget and labeled “Difference.” If your difference is a positive number that means you’ve already met or exceeded your monthly revenue goal for the current month. If it’s a negative number it means you’re still working towards your monthly revenue goal for the current month. You’ll also see a percentage value in light gray next to your total revenue for this month. This percentage tells you how close you are to meeting your monthly revenue goal. For example, if the percentage value is 70%, that means the total revenue you’ve received this month is 60% of your monthly revenue goal. You still have 30% more to go before your goal is met. This widget displays the total accumulated revenue (invoice payments) you’ve received to date for the selected year, and compares it to your accumulated revenue goal. Your accumulated revenue goal is the amount of revenue Harpoon thinks your business should’ve already brought in by this point in the year in order to stay on track to meeting your Yearly Revenue Goal. Your accumulated revenue goal is displayed at the bottom of the widget and labeled “Goal.” The difference between your total accumulated revenue to date and your accumulated revenue goal is also displayed at the bottom of the widget and labeled “Difference.” If your difference is a positive number that means you’ve already met or exceeded your accumulated revenue goal. If it’s a negative number it means you’re still working towards your accumulated revenue goal. 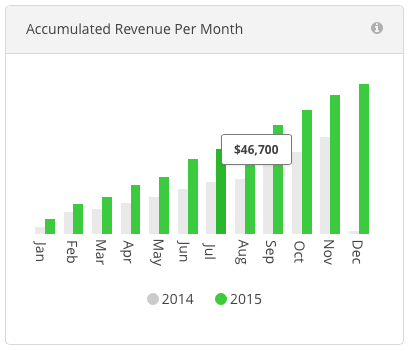 You’ll also see a percentage value in light gray next to your total accumulated revenue. This percentage tells you how close you are to meeting your accumulated revenue goal. For example, if the percentage value is 60%, that means the total accumulated revenue you’ve received is 80% of your accumulated revenue goal. You still have 20% more to go before your goal is met. 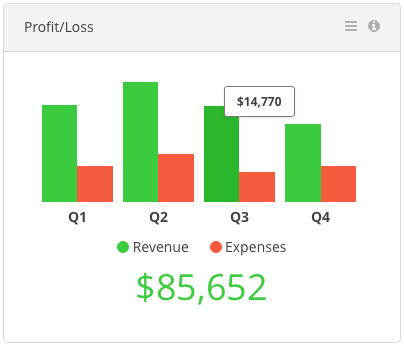 This widget displays your total quarterly revenue (invoice payments) compared to your total quarterly expenses and displays your total profit or loss for the selected calendar year. Hovering over any of the bars in this widget will display the totals for each bar. This widget looks at all of the revenue (invoice payments) you’ve received for the selected year that are associated with projects and displays your average revenue per project. 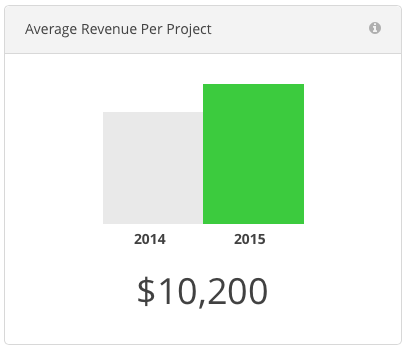 It also gives you a side-by-side comparison to the previous year’s average revenue per project. This widget gives you a breakdown of all the outstanding, unpaid invoices you have in your Harpoon account. These include invoices that have statuses of Sent, Viewed, and Partial. The invoices are broken down by how long they’ve been outstanding. 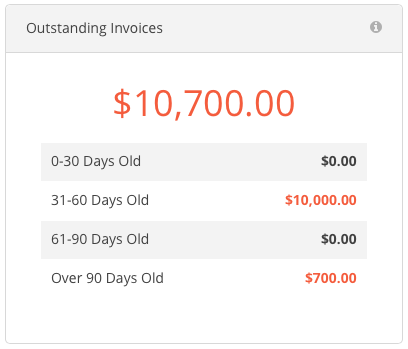 Clicking any of the outstanding amounts in the widget will take you to a kanban-style board view of your Invoices screen where you can see all of your unpaid invoices grouped together on the Unpaid board. Based on your current revenue (paid invoices) this widget calculates how many days you could take off work and still meet your accumulated revenue to date goal. 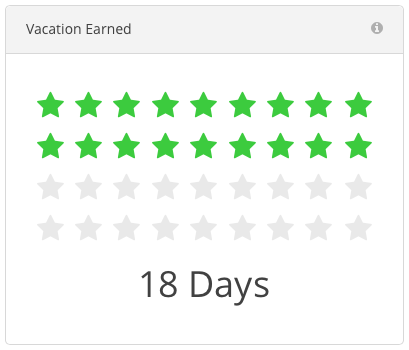 You won’t start earning vacation days until your Accumulated Revenue to Date widget (explained above) shows that you’re exceeding your accumulated revenue goal. This widget displays the total amount of revenue (invoice payments) you’ve received for each quarter of the selected year, compared to the corresponding quarters of the previous year. Hovering over any of the bars in this widget will display the totals for each bar. This widget comes in handy if you pay your taxes on a quarterly basis. This widget displays the average amount of revenue (invoice payments) you’ve been making per hour for the selected year, and compares it to your average revenue per hour goal. Your average revenue per hour goal is the average amount of revenue Harpoon thinks your business should be making per hour in order to meet your Yearly Revenue Goal, and it’s based on a combination of your Yearly Revenue Goal and the average number of working hours per day, working days per week, and days off per year you have set in your General Settings. Your average revenue per hour is not the same thing as your hourly rate because your average revenue per hour takes into account not only your client billable hours, but all of the hours you typically spend on your business. For example, you might make $100/hour when doing work for your clients (billable hours), but when you include all the other work you do for your business (non-billable hours) you might end up with an average revenue of $70/hour. Your average revenue per hour goal is displayed at the bottom of the widget and labeled “Goal.” The difference between your actual average revenue per hour and your average revenue per hour goal is also displayed at the bottom of the widget and labeled “Difference.” If your difference is a positive number that means you’re ahead of your average revenue per hour goal. If it’s a negative number it means you’re behind. You’ll also see a percentage value in light gray next to your average revenue per hour total. This percentage tells you how close you are to your average revenue per hour goal. This widget displays the average amount of revenue (invoice payments) you’ve been making per day for the selected year, and compares it to your average revenue per day goal. Your average revenue per day goal is the average amount of revenue Harpoon thinks your business should be making per day in order to meet your Yearly Revenue Goal. It’s based on a combination of your Yearly Revenue Goal and the average number of working days per week and days off per year you have set in your General Settings. Your average revenue per day goal is displayed at the bottom of the widget and labeled “Goal.” The difference between your actual average revenue per day and your average revenue per day goal is also displayed at the bottom of the widget and labeled “Difference.” If your difference is a positive number that means you’re ahead of your average revenue per day goal. If it’s a negative number it means you’re behind. You’ll also see a percentage value in light gray next to your average revenue per day total. This percentage tells you how close you are to your average revenue per day goal. 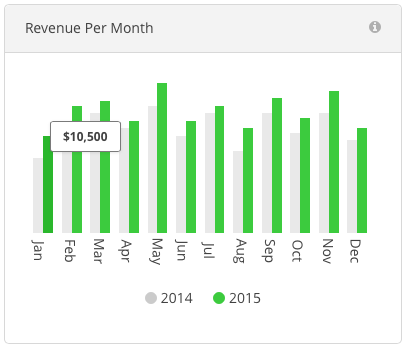 This widget displays the average amount of revenue (invoice payments) you’ve been making per month for the selected year, and compares it to your average revenue per month goal. Your average revenue per month goal is the average amount of revenue Harpoon thinks your business should be making each month in order to stay on track to meeting your Yearly Revenue Goal. Your average revenue per month goal is displayed at the bottom of the widget and labeled “Goal.” The difference between your actual average revenue per month and your average revenue per month goal is also displayed at the bottom of the widget and labeled “Difference.” If your difference is a positive number that means you’re ahead of your average revenue per month goal. If it’s a negative number it means you’re behind. 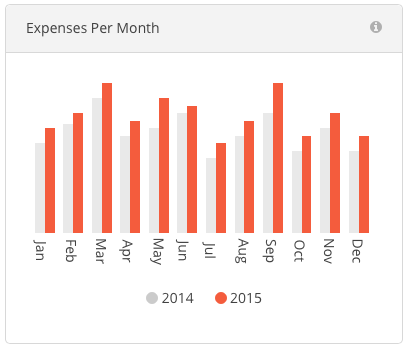 You’ll also see a percentage value in light gray next to your average revenue per month total. This percentage tells you how close you are to your average revenue per month goal. This widget displays your total revenue (invoice payments) for each month of the currently selected year, compared to the corresponding months of the previous year. Hovering over any of the bars in this widget will display the totals for each bar. This widget displays your monthly accumulated revenue (invoice payments) for the currently selected year, compared to the corresponding months of the previous year. Hovering over any of the bars in this widget will display the totals for each bar. This widget displays your total expenses for each month of the currently selected year, compared to the corresponding months of the previous year. Hovering over any of the bars in this widget will display the totals for each bar. This widget displays a revenue forecast for the selected year based on your current revenue velocity, and compares the revenue forecast to your Yearly Revenue Goal. Your Yearly Revenue Goal is displayed at the bottom of the widget and labeled “Goal.” The difference between your revenue forecast and your Yearly Revenue Goal is also displayed at the bottom of the widget and labeled “Difference.” If your difference is a positive number that means based on your current velocity you have a good chance of meeting or exceeding your Yearly Revenue Goal by the end of the year. If it’s a negative number it means you might need to speed things up. 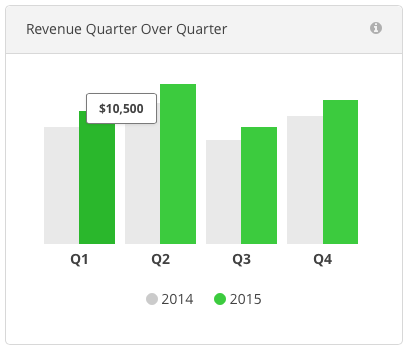 You’ll also see a percentage value in light gray next to your revenue forecast total. 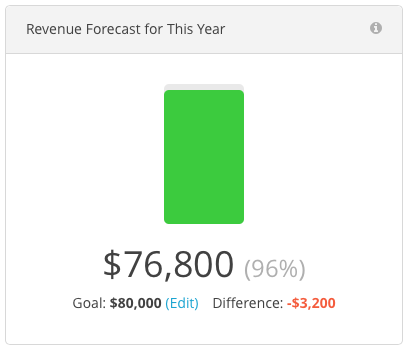 This percentage tells you how close you’re expected to be to your Yearly Revenue Goal by the end of the year. This widget displays the revenue (invoice payments) you’ve received for the selected year organized by the top revenue sources. When you create a client in Harpoon you have the option of selecting a “source” for that client. The source is the method that led you to the client, or that led the client to you. Some examples of sources would be referrals, advertising, or networking. This widget can show you which sources have been the most profitable for your business and might be worth putting more investment into. 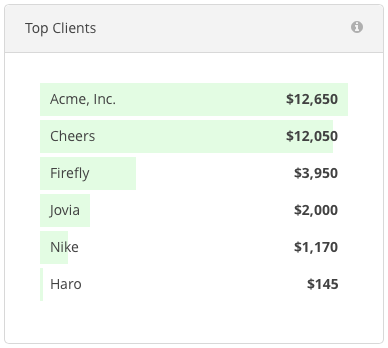 This widget displays a list of your top clients organized by the amount of revenue (invoice payments) you’ve received from each client for the selected year. To learn more about the Dashboard view the Dashboard support articles.